A spy movie, cross territory espionage and four horrid murder leaving in a pool of blood, but where does the above stated title comes in. 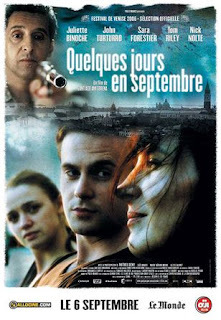 Well, it all comes in "Quelques jours en septembre" ala "A few days in September". Cinematographer having great fun with focus puller, script writer inspired by homer or some critic easily blaming it all by calling it a French Art Film, this film is all there to be misunderstood. What is there for you as a viewer is an experimental look into the genre of spy thriller. Breaks all rules on the book in film making and yes editing in the film is a high point. John Turturoo takes up the role of a maniacal killer blabbing out poetry between every murder and still careful not stepping into his victim’s blood and it fills the room. A verbal duet between American brother and French half sister and they finally sleeping together, Juliette Binoche, passing off again so organically into her role of a turtle rearing spy, who even after leaving the trade is so good with cleaning her pistol. The narrative so unwieldy and always relying on the forthcoming event, ‘a few days in September’ is a relief from other ordinary films where murder and spies are treated like heroes made out of villains. I particularly loved the pillow fight sequence and the verbal duet between the siblings on what makes an American. Only at the end of the film, you realize the story hinges on the event of September 11 attack, but the film is absolutely non-political. Each character is beautifully crafted and the editing is really a treat in the film. I like the prominence of the cinematic language so obvious from the film, where the viewer is keep on the tenterhooks on to what are these few days in September holding on to. A must watch film simply because such films are such a rarity. A cinematic experience and particularly watch out for the last shooting sequence between Juliette Binoche and John Turturoo. Another lesson on film editing. Thank you Santiago Amigorena for that. Irene (Juliette Binoche), a French Secret Service vet, hasn't heard from former espionage colleague Elliot (Nick Nolte) for 10 years when he contacts her out of the blue to fetch his daughter Orlando (Sara Forestier) for him. Lass was only 12 when her dad was summoned back to the U.S. for an identity change after his French wife's death. U.S.-hating Orlando, who raises geese in a small French town, sullenly accompanies Irene to a Paris hotel room where the dad she hasn't seen for a decade has promised to meet them. The real fun starts when one William Pound (John Turturro) asks for the room. Turturro narrowly avoids self-parody as an unhinged multi-lingual U.S. government agent who spouts poetry between lethal hits.